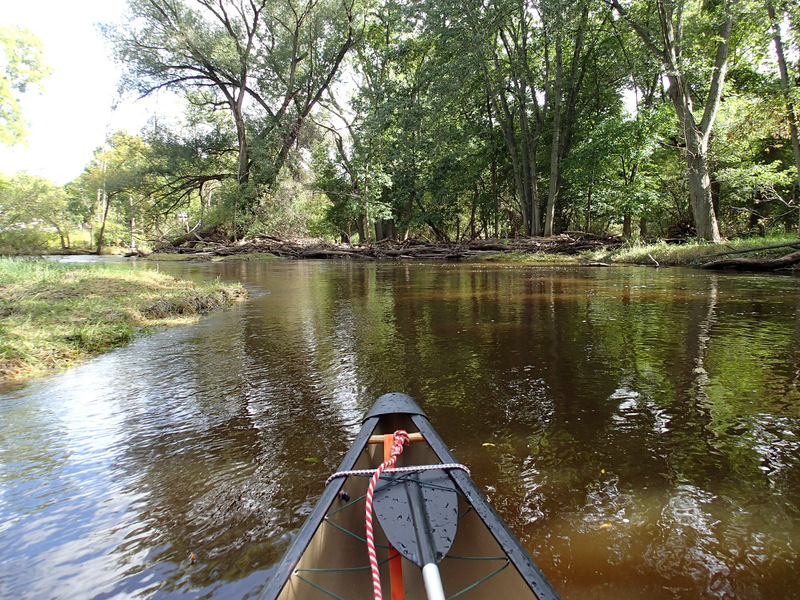 The Menomonee River seldom runs high enough for paddling, but after plentiful rains it served up perfect conditions. Riffles, wave trains, a bit of flatwater, enough obstacles to make it interesting, and a few moments needing technical skills made for a very pleasant outing. At this level, the river rewards those with good maneuvering skills but won’t trash a less-experienced paddler; that said, it isn’t for beginners. This trip, for this canoeist, was perfect. Gauge note: Given that the river was running at 375 cfs when I was on it, and that seemed just about perfect to me, I’d say the maximum flow rate for reasonably safe paddling would be about 600 cfs. I’ve watched the river as it came down from over 2,000 cfs, and it still seemed too fast at 1,000. It might be OK at 800, but I might hesitate to paddle it solo. I’d want someone on hand in case of a dump. It was at 375 cfs, which I thought was just perfect. Only a few places were shallow enough to scrape my 52″ paddle. According to the other trip report for this river, 250 cfs is the minimum level. Time: Put in at 2:55p. Out at 4:15p. Wildlife: Great blue heron, green heron and several flocks of mixed mallards. I’m a dedicated river paddler and a former canoeing instructor, so I’m just naturally drawn to moving water. I moved to Wauwatosa a few months ago and discovered this cute little stream 1/4 mile from my new house. It’s paddleable only after a rain, so I’ve been keeping tabs on it. On this day, it had drained enough from the past few weeks’ flooding that I thought it would be a good level to try, and it was. Thanks to the previous trip report for this river, I knew not to try it below 250 cfs. From what I saw, I’d say that’s good advice. At this flow level, the Menomonee River is arguably a Class II stream. It has many stretches of whitewater, by which I mean standing waves of a foot or more, with one short stretch of two-footers below a two-foot drop. I was expecting a lot of deadfall, and there was (as the pictures show), but I was surprised that there were no sweepers or strainers that required either pulling over or portaging. Though I believe this is best for the experienced canoeist, a tandem team with one experienced and one intermediate canoeist would probably do OK. Definitely not beginner level. If paddling tandem, the bow person needs solid draws and cross-draws, as well as sweeps and back strokes. The stern person needs to know how to follow the bow, i.e., whether to sideslip or turn. At least one of them should have good river-reading skills. And they definitely need to be able to execute a reliable backferry. Anyone paddling solo needs a full suite of well-practiced strokes and maneuvers, especially sideslips and backferries. Some whitewater experience would be good. The previous trip report described in lurid detail a series of logjams upstream from Mayfair Road, so I opted to avoid those killer logjams (thank you to whomever wrote that report) since I’m not into that kind of fun so I put-in just east of Mayfair Road. Parking is on either the Menomonee River Parkway or one of the adjoining side streets. Also, that report described a “commando” take-out at a set of three old bridge abutments. That would have been possible, but there is a large river-wide sweeper just upstream that I don’t think could be passed by a solo paddler. So I found a spot further upstream, which involved dragging up a short, steep, overgrown bank – much easier than the old bridge take-out. The pictures pretty much tell the story. The put-in was somewhat flooded, just dry enough to be walkable but wet enough to be messy. As soon as I was afloat, I was swept along in the 3-4 mph current. The river alternates among stretches of flatwater, riffles and rapids. It isn’t particularly twisty, like the Mecan River or Badfish Creek (my two favorites), but with a fast current and a lot of obstacles partly blocking the river, I needed good maneuvering skills. I used to tell my canoeing students that the backferry is the most important tool in the paddler’s toolbox, and this river proved me right, as others have in the past. I employed that maneuver at least a dozen times, one of which saved me from crashing into a rocky bank with a big snag in it. I rate the river at Class II at this flow rate because of many standing waves requiring a high brace, many places requiring good maneuvering skills (to avoid obstacles), and many opportunities to execute a backferry. There are few places to eddy out, but because the river was unobstructed, they weren’t needed. In case of a capsize, rescue could be difficult because of the speed of the current. Paddling solo, self-rescue could be particularly difficult. I suspect a high risk of foot entrapment due to the many rocks along the entire length of the river. All of these factors contribute to my rating. The previous report described the river environs, so I won’t go into that. It was a blast! Standing waves, maneuvering around obstacles, seeing wildlife, a partly sunny day in the low 70s – what’s not to like? The river was quite lively – fast but not pushy. I was fully occupied the whole time, except in a few quiet places where I could drift long enough to get a drink of water. One thing that was really fun to see from the water was the outdoor restaurant seating area where I had dinner with a friend a few weeks earlier in Tosa Village. There are several very nice restaurants that can be accessed from the base of the bridge. On the right bank, just upstream from the bridge, is a set of concrete stairs that lead up to street level. If you can tether your boat, it would make a nice stop in the trip. Speaking of which, another local point of interest is the Hoyt Park beer garden. Drinking and boating of any kind don’t mix, but it’s a nice spot to socialize and get a bite to eat. However, I don’t know of a way to access it from the water. Lastly, several times while on the river I recalled the previous trip report’s mention of odd smells, something I’d read about earlier from others. However, as much as I sniffed around for anything industrial or otherwise pollutant, I found nothing. I can’t say I disliked any aspect of the trip. I knew to expect an urban environment, so seeing houses, people and some occasional trash didn’t surprise or particularly concern me. Because I have good paddling skills the river didn’t present any particular challenge except for the emergency backferry to avoid the rocky bank in the S-turn. But even that was fun, though a bit hair-raising. The golf ball that landed about 10 yards in front of me, just before the hairy S-turn, was a surprise. I guess I didn’t much like the possibilities around that. There’s one aspect of this river that calls for caution: there are few places to eddy out in case of a problem. By that, I mean that although variations in width create a lot of standing waves, they don’t provide many eddies to take refuge in. I can easily imagine obstacles that could require scouting, and the lack of eddies means there’s no place to do that from. Also, in many places there are stone walls instead of riverbanks, and with a fast current you need to be careful to look well ahead for obstacles. On the other hand, these factors preclude the development of cross-currents, which appear in only a few places that call for backferrying. I would do this trip again, with no changes. It was pretty near perfect. I guess I’d have taken a little less mud at the put-in so I could change out of my biking shoes without getting the canoe dirty. The bike shuttle is very pleasant. The Menomonee River Parkway follows the river. It has two parts, a two-lane road with parking on both sides, and a separate paved multi-use path. Although it crosses several major streets – with stoplights – it’s a very nice ride. Small ledge north of North Avenue.